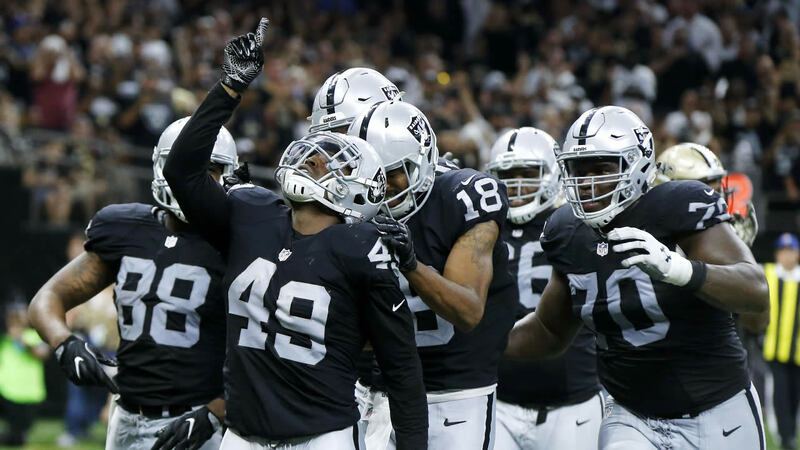 OAKLAND, Calif. (KGO) -- David Carr hit Seth Roberts for a 10-yard touchdown with 47 seconds left, then connected with Michael Crabtree on a 2-point conversion, and the Oakland Raiders pulled out a season-opening 35-34 victory over the New Orleans Saints on Sunday. The Raiders had to overcome a 14-point, second-half deficit and a 424-yard, four-touchdown performance by Drew Brees. They also had to sweat out rookie kicker Wil Lutz's last second field goal attempt from 61 yards, which narrowly missed wide left as the Superdome crowd briefly erupted before realizing the kick was no good. The decision to go for 2 late pays off as the Raiders top the Saints. Brees eclipsed 400 yards passing for the 14th time in his career, tying Peyton Manning for the most such performances in NFL history. Carr finished with 319 yards and one touchdown passing. Jalen Richard ran 75 yards on his first NFL carry, and Amari Cooper caught Carr's pass for a 2-point conversion to briefly tie the game at 27 in the middle of the fourth quarter. But Brees marched New Orleans back down field for a score, highlighted by a 57-yard completion that receiver Willie Snead fumbled and rookie wideout Michael Thomas recovered and advanced to the Oakland 2. That set up Travaris Cadet's short touchdown catch to give New Orleans a 34-27 lead. Snead finished with nine catches for 172 yards and New Orleans nearly held on, but Saints linebacker Craig Robertson was flagged for interference on a four-down pass that sailed out of bounds. The Raiders had touchdown runs of 6 yards by Latavius Murray and 2 yards by Jamize Olawale. Crabtree's winning conversion catch came against undrafted rookie Ken Crawley. CAREER KICKOFF: Lutz made two of four field goal attempts - missing twice from 50 or more yards - in his NFL debut. Payton made the surprising move of cutting veteran incumbent kicker Kai Forbath in favor of Lutz this past week after the undrafted rookie out of Georgia State had been waived by Baltimore. Lutz hit his first field goal from 42 yards out. He also handled kickoffs and hit a 20-yard field goal that was nearly blocked. INJURIES: Raiders right tackle Menelik Watson left the game late in the first half with what team officials said was a groin pull. Drew Brees drives Saints down to set up a 61 yard FG. Rookie Will Lutz kicks it..... No good. Raiders win 35-34. Wow what a game. 61-yard attempt for the Saints misses. What an insane win for the #Raiders. Huge power move by Jack Del Rio going for two.